System Ninja contains a unique dual cleaning engine. It scans your entire hard drive performing a thorough initial scan, identifying junk based on heuristics. System Ninja then continues to check locations that are known to contain junk based on a number of routines. This means System Ninja takes a little longer to complete a scan, but the clean is much more thorough than other products. The checkboxes on the right hand side of the program control what kind of files are detected by the scanning engine. The “Internet” settings allow System Ninja to clean all web browsing programs currently installed on the computer. You cannot clean a web browsing program while you have it open. If System Ninja detects that the program is open, you will be asked to close it. System Ninja’s cleaning engine supports a growing number of web browsers. Google Chrome, Opera, Internet Explorer and Mozilla Firefox are all supported in varying degrees. Cookies, Internet Cache, Session Logs, Thumbnail Icons and Browsing History are targeted in most browsers. System Ninja automatically downloads new cleaning rules in the background, while you use it. These rules instruct System Ninja to detect specific files on your computer. Each newly downloaded rule must pass rigorous security measures before being permitted to remove files from your computer. All files with the .tmp file extension are removed from the entire filesystem. Files contained in the predefined “Temp Folders” are also included. These locations include C:Users*AppDatatemp and C:Windowstemp, among others. These are small text files that are distributed with torrent downloads, typically to promote the source of the torrent uploader. Files such as Tracked by Demonoid.com.txt are included. This includes a number of file extensions that are not supported by the Windows Operating System. Macintosh-specific image formats (such as .icns) and cache formats (such as .DS_Store) are included. Mac ZIP file metadata is also detected, which usually exists as a folder titled ‘__MACOSX‘. Thumbnail Caches include files from predefined Windows locations. Thumbs.db files will also be detected across the entire filesystem. 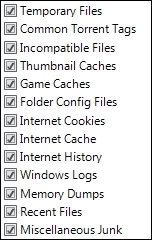 This option includes temporary files created by popular video games. These rules are distributed by CleanSync; and at the time of writing, include The Sims 2, The Sims 3 and several Star Wars games. This detects desktop.ini files across the entire filesystem. These are small text files that inform Windows how it should display specific folders. When they are removed, Windows simply reverts to the default settings. This option is disabled by default. This cleans the contents of C:WindowsLogs and several other locations. Windows Error Reporting and CBS logs are also included. This detects .dmp files from across the entire filesystem. Windows stores a list of the most recently used files to improve performance and productivity. Removing them can be a useful way to improve privacy and save disk space.